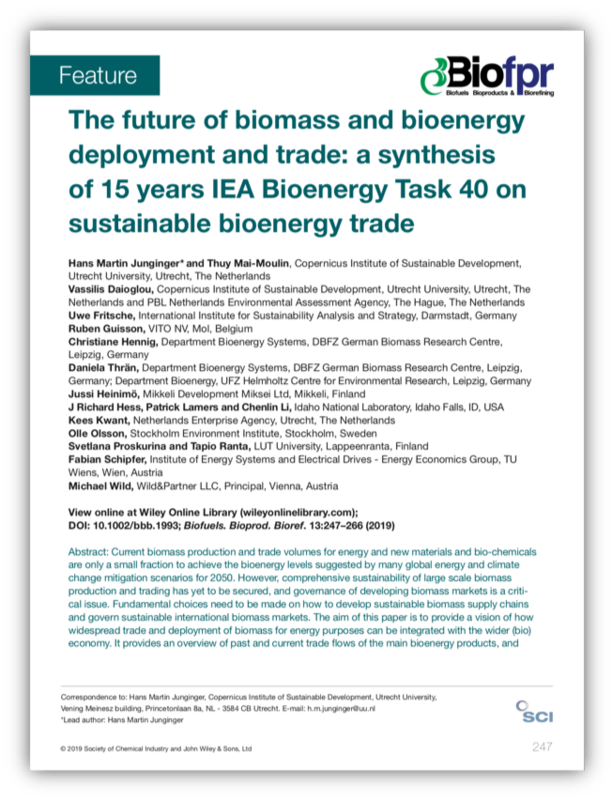 The aim of this IEA Bioenergy Task 40 paper is to provide a vision of how widespread trade and deployment of biomass for energy purposes can be integrated with the wider (bio)economy. It provides an overview of past and current trade flows of the main bioenergy products, and discusses the most important drivers and barriers for bioenergy in general, and more specifically the further development of bioenergy trade over the coming years. It discusses the role of bioenergy as part of the bioeconomy and other potential roles; and how it can help to achieve the sustainable development goals. The paper concludes that it is critical to demonstrate innovative and integrated value chains for biofuels, bioproducts, and biopower that can respond with agility to market factors while providing economic, environmental, and societal benefits to international trade and market. Furthermore, flexible biogenic carbon supply nets based on broad feedstock portfolios and multiple energy and material utilization pathways will reduce risks for involved stakeholder and foster the market entry and uptake of various densified biogenic carbon carriers. recognizing the diversity in biomass resources, value chains and competitive applications for bioenergy, biobased materials and products (bioeconomy context). IEA Bioenergy is an organisation set up in 1978 by the International Energy Agency (IEA) with the aim of improving cooperation and information exchange between countries that have national programmes in bioenergy research, development and deployment. The International Energy Agency acts as energy policy advisor to 28 Member Countries plus the European Commission, in their effort to ensure reliable, affordable, and clean energy for their citizens. Founded during the oil crisis of 1973-74, the IEA’s initial role was to co-ordinate measures in times of oil supply emergencies. As energy markets have changed, so has the IEA. Its mandate has broadened to incorporate the “Three E’s” of balanced energy policy making: energy security, economic development, and environmental protection. Current work focuses on climate change policies, market reform, energy technology collaboration and outreach to the rest of the world, especially major producers and consumers of energy like China, India, Russia and the OPEC countries. Activities are set up under Technology Collaboration Programmes. These are independent bodies operating in a framework provided by the IEA. There are 42 currently active Technology Collaboration Programmes, one of which is IEA Bioenergy.